This Zelda unitard I won at an eBay auction in 2001. 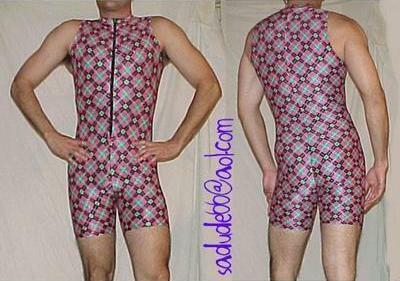 Seller was txdude2000, and it was given this description at the auction: This great singlet unitard is Zelda brand. As you all can see, it has a zipper in the back (although for the picture I wore it backwards because nobody was here to help me pull it up). Size is Medium. I am 32" waist and 6' tall and they fit just perfect. They are used but still in very good condition.